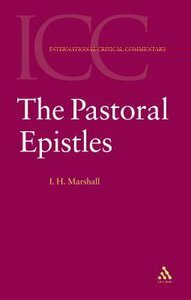 I. Howard Marshall (Ph.D., University of Aberdeen) is emeritus professor of New Testament exegesis and honorary research professor at the University of Aberdeen. He is the author or editor of numerous books, including Concordance to the Greek New Testament (6th edition), The Gospel of Luke (New International Greek New Testament Commentary), The Epistles of John (New International Commentary of the New Testament), A Critical and Exegetical Commentary on the Pastoral Epistles (International Critical Commentary) and Acts (Tyndale New Testament Commentary). His most recent volumes are Aspects of the Atonement, The Letter to the Romans (The Two Horizons Theological Commentary) and A Concise New Testament Theology.